Halloween Wars will return to the Food Network for its fourth season, premiering Sunday, October 5, 2014 at 9pm ET! Halloween Wars returns, as five teams made up of an expert pumpkin carver, a cake decorator, and a sugar artist go to battle to create mind-blowing Halloween-themed displays, in hopes of winning the coveted title of Halloween Wars champion and a $50,000 grand prize. For the teams’ first competition, they must capture all the freights of a terrifying haunted farm. In the end, one team will be eliminated. Includes special guest judge Naomi Grossman, from American Horror Story: Asylum. The four remaining teams made up of an expert pumpkin carver, cake decorator, and sugar artist compete to create mind-blowing Halloween-themed displays that evoke the dire warning: whatever you do, don’t go into the forest! One team will be eliminated, leaving the three remaining teams one step closer to the $50,000 grand prize. Includes special guest judge Adi Shankar, film producer of The Grey and Dredd. Three remaining teams made up of an expert pumpkin carver, cake decorator, and sugar artist go head-to-head to create mind-blowing Halloween-themed displays that capture an epic battle between terror icons: Mummies vs. Werewolves! Which team will scare the judges the most? Special guest judge actor Francia Raisa, actress of The Secret Life of the American Teenager and the cult horror hit Chastity Bites, helps decide which teams move on to the final battle. It’s all come down to this epic, final battle. Two teams remain and will compete to create terrifying Halloween-themed displays that capture the twisted, demonic world of a haunted carnival. 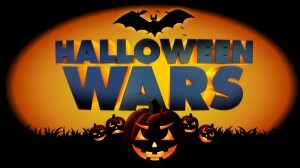 Only one team can take home the coveted Halloween Wars championship and a $50,000 grand prize. Horror actor Lew Temple, best known for his roles in hits like The Walking Dead and The Devil’s Rejects, helps crown the winner. The last team standing wins the title of Halloween Wars champion and a $50,000 grand prize!